This article has been resurfaced in honor of what would have been Nelson Mandela’s 98th birthday. It was originally published as part of The Undefeated’s #RememberWhensdays series. More than 1 million people filled the streets of New York over a three-day stretch in June 1990. There was a ticker-tape parade through the Canyon of Heroes, a Harlem street rally, a speech at a Brooklyn high school and, finally, an electric Yankee Stadium concert. The three-day whirlwind New York trip was part of a larger six-week Freedom Tour that saw one man visit 13 different countries. One historic man, that is: Nelson Mandela. The South African activist who would be elected president in 1994 was a champion of peaceful protests and a global advocate for human rights, forever working to try to end apartheid. His leadership and principles were rewarded — with a nearly three-decade prison sentence in 1962. Mandela’s first word to tens of thousands of blacks who had not seen his face or heard his voice for 27 years was one of defiance. “Amandla!” — Power! — he shouted in a firm but slightly scratchy voice. Thousands of voices rang out with the reply: “Awethu!” — Is ours! At the time, Mandela was 71, but you couldn’t tell on first glance. 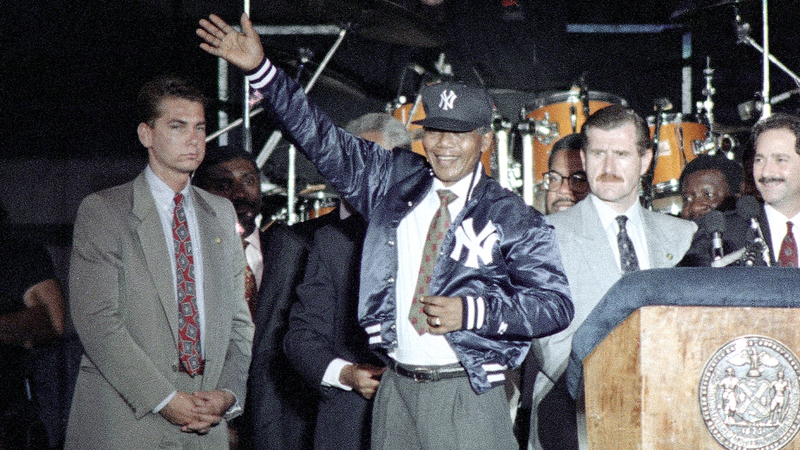 Before leading the crowd at Yankee Stadium on June 21, 1990, Mandela delivered a speech at Riverside Church that culminated with folks dancing in the aisles. Before the church service, Mandela delivered speeches outside the chapel and he received a check for $200,000 to be used for schools, housing, medicine and refugee assistance in South Africa. Winnie, Mandela’s wife at the time, and the Rev. Jesse Jackson flanked Mandela, as a standing ovation emerged. ”Do I look like a tired man?” Mandela asked the New York Times. Mr. Mandela ended his speech by embracing New York as the city has embraced him. ”The people of New York, we admire you, we respect you and, above all, we love you,” he said. Even former Yankees owner/curmudgeon George Steinbrenner couldn’t help but be impressed. After the rollicking speech, Steinbrenner showed up at City Hall the next morning with a check to cover all the expenses incurred from Mandela’s three-day fundraiser, according to the New York Daily News.